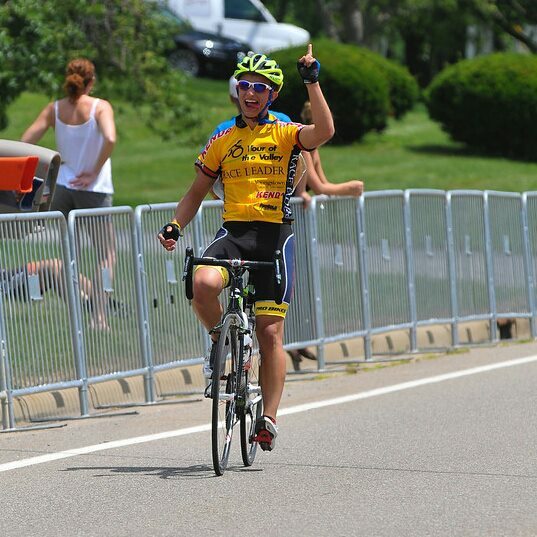 HVT Athlete Ryan Munko took the 2013 Tour of the Valley Stage Race Yellow Jersey home! Since its in inception in 2008, Human Vortex Training has helped athletes of all backgrounds, with many different goals to ride healthy, compete strong, and achieve at the National and International levels. From middle school Principles looking to inspire their students by completing a 100 mile ride, busy Surgeons looking to become the fastest and most competitive then can be, and a 45 year old mother of 2 who just wanted someone to help her resolve her back pain so should could ride again with her kids, Coach Brodie has shown the ability to help tremendously! Many of the riders we work with enjoy Charity and Group Rides, and are looking to improve their fitness, so they can ride longer, and stronger: From riding your first MS 150, to riding the Mount Ventoux Times 2 Challenge, we're here to help you! HVT Riders see incredible advancements in their abilities both on and off the bike, in large part thanks to our work with Racers of all backgrounds and with different aspirations. From regional race series, National Championships, International 3-day stage races, racing in Belgium and Holland, to Foreign National Championships, our training programs are proven the world over. Listed below are just a handful of the numerous accomplishments we have helped athletes to achieve since 2008. Sign up with your email address to receive news and updates, and to help us develop programs to help meet YOUR needs! We respect your privacy. Information will not be shared.